The skies have cleared and the air temperature is rising to a more normal feel. As the sun was rising around 7am the air was at 51 degrees and the group was "charging". Today's venture was a ride out of the Washington, DC area down the coast. 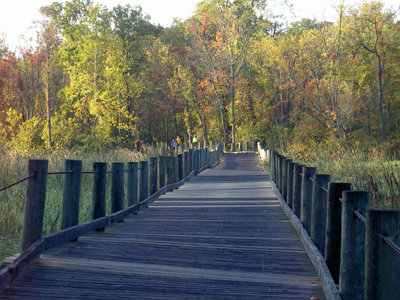 The bike trail in Alexandria follows the Potomac starting at the bottom of Kings Street and proceeding all the way to Mount Vernon. Our hotel was at the top of Kings Street, so the beginning of the day was all down hill!! 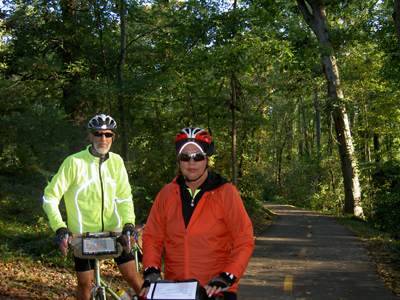 Seven miles into the day and we were emerging out of the woods into the parking lot of Mount Vernon. Being a Sunday and early, there was very little tourist traffic so gliding through was easy. Unfortunately we had a very long day to ride, so any idea of stopping to see the estate is quickly abandoned. 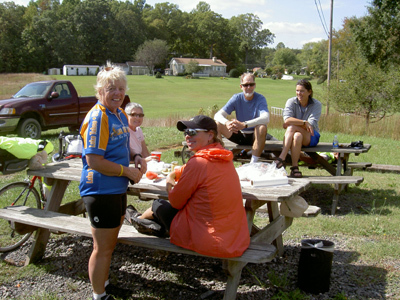 The route that was followed was the "Biking US 1" -- like the Highway US 1 it crosses Virginia from north to south. The major difference is that it stays to the rural areas and off major highways. 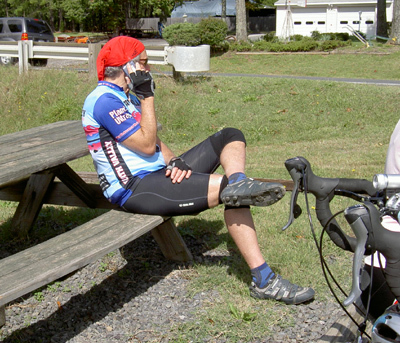 It was so nice to just sit back and pedal when needed and coast when tired. The roadway for the most part was rolling with the ups not quite as big as the downs, which makes for a lot of gliding down the highway. The countryside didn't change much other than in economic status. One can tell by the newspaper containers attached to the mailboxes. Washington Post is usually in the more affluent sections with the local weekly in the more simpler areas. The homes reflected the same. Large multibedroom homes sit on large acreage with long winding driveways and gated entrances occupying large sections of the area only to be neighbors with trailers lined up along the roadway with their pickup trucks double parked in the front yard. Mile after mile the landscape continues with little to no change. No towns or villages presented themselves, which also meant no facilities. 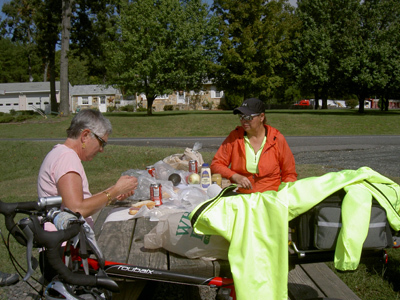 However, this did not stop this group from having a great lunch, picnic style along side the road. Nancy outdid herself as "sag" today to present the hungry group with a feast! 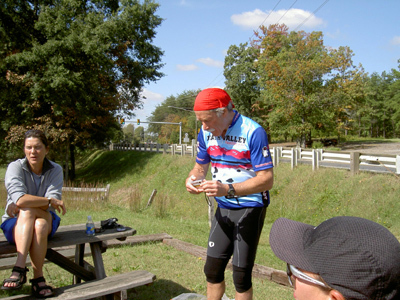 Eighty miles is a full day -- when the terrain is gentle it is a fun day to just daydream. Also this being Sunday, "rush hour" is not existent. What a life. 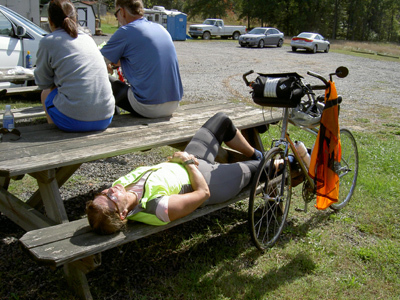 Just sit in the saddle, pedal when needed and dream -- or think -- or meditate -- or whatever it takes to entertain yourself for over eight hours! No interruption other than which turn to take, no responsibilities other than keeping the bike balanced and safe -- life can be so grand!!! Fredericksburg is home tonight. Like its sister Alexandria, it is steeped in history. Just outside the town is Ferry Farm, the boyhood home of George Washington. This is the setting for the stories of the cherry tree and the silver dollar (which was really a stone) thrown across the Rappahannock River. Also within the city limit sits the Confederate Cemetery. 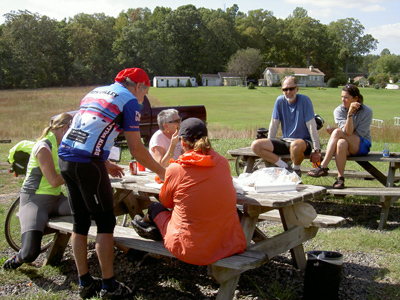 Local women concerned about unattended plots formed the Spotsylvania Memorial Association. In 1866 they established a Confederate Cemetery on five acres of land a half mile northeast of the Court House. The Association reburied nearly 600 soldiers from 10 states in the new location. Most are identified and organized by state. A few remain unknown. Headstones provided by the federal government mark all of the graves. In the center of the cemetery, a granite shaft crowned by a stone confederate solider silently stands watch over the dead. The "Old Town" today is the home to shops, restaurants and ice cream parlors. Dinner on Main Street and then back to the motel to collapse after such a long, but beautiful ride. Jan: "Frankie, How do I do This?" Sue, Jan, Frankie, Mark and Nancy at Lunch! Maxwell: "Just One More Picture!"